Sgneep-Script consists of a simple program whose purpose is the interaction with other programs, much more complex, in which the most significant operations take place. With Sgneep-Box script the programmer is not interested in the system resources that the finished program will have to consume, delegating the whole Sgneep-Box OS. For resources we mean, for example, sensor control, video playback, initialization and closing of the application. In this way we avoid many problems typical of traditional programming, which is subject to insidious errors, not easily identifiable and dangerous, and also forces the programmer to deal with issues not strictly related to the objective of the software to be created. First we need to have 1 raspberry pi3 model B, a 32GB usb stick, and a micro-SD card with RaspBian Installed. The micro-SD will be used to set the raspberry pi3 in UsbMode. 1- Ensure the Device drop down box has the drive your USB MEMORY STICK is insered into. 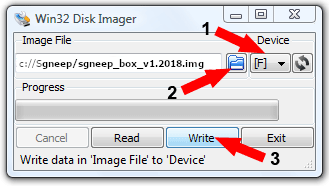 Wait for Win32 Disk Imager has finished, remove the usb stick and insert it into your raspberry pi3. If you've run the guide correctly you're ready to use Sgneep-Box by turning on your raspberry pi3. After starting up, you will hear the welcome message and imediately the Sgneep-Box Terminal will open. You can control Sgneep-Box only from this terminal. For an overview of the commands, check this page.